This peaceful community, gateway to the remote regions of the High Lakes of Butte and Plumas Counties, owes its origin and subsequent development to the entrance of the Diamond Match Company to California. 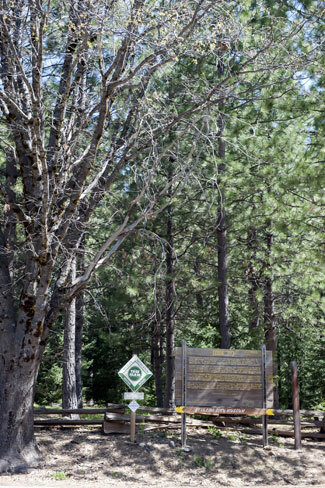 With the purchase of about 40,000 acres of virgin timber lands in the Ramsey Bar - Kimshew areas, Diamond, between the years 1901-1904, financed the survey and construction of the Butte County Railroad from Chico to here. It had already acquired some 1200 acres at this place, upon which to erect the most modern sawmill in California, along with the building of a town six blocks long and five wide. The later included water, electricity, graded streets, sidewalks, sewers, houses, stores, and the sawmill & pond. At the onset the hardy lumbermen lived in tents, despite the severe winters. The initial boilers to arrive were 'Stirlings,' hence the name. Surviving a fire in 1931 destroying most all the original buildings, the struggles of fifty years, and eventual ending of Diamond's sawmill operations here the town has retained its interesting history and maintained its identity. 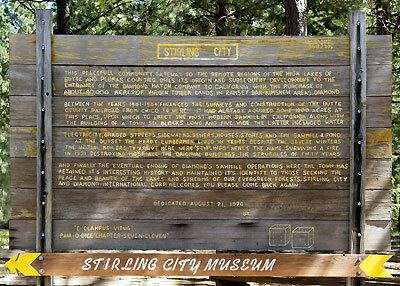 To those seeking the peace and beauty of the lakes and streams of our evergreen forests, Stirling City and Diamond International Corp. welcomes [sic] you. Please come back again.